On a new craniophore for use in making composite photographs of skulls. Journal : Memoirs of the National Academy of Sciences ; vol. III. ; pt. 2 (14th Memoir). Washington: Government Printing Office, 1886. Description : 117-119 p., [4 l.] pl. ; ill: 4 photo-chromoliths. ; 30 cm. Photographs : 4 photo-transfer chromolithographs of a craniophore. Photographer : coauthor, Washington Matthews. Subject : Cranium — Craniophore ; photography. Bound with: (1885) Billings & Matthews. Authors caption: By John S Billings and Washington Matthews. Reprint: Photographic Times and American Photographer, vol. xvi. Reprint: Journal, Royal Anthropological Institute of Great Britain, vol. 16, p. 97-98 & pl. Printer caption: J[ulius] Bien (1829-1909). Photographs reproduced as woodcuts in the reprints. 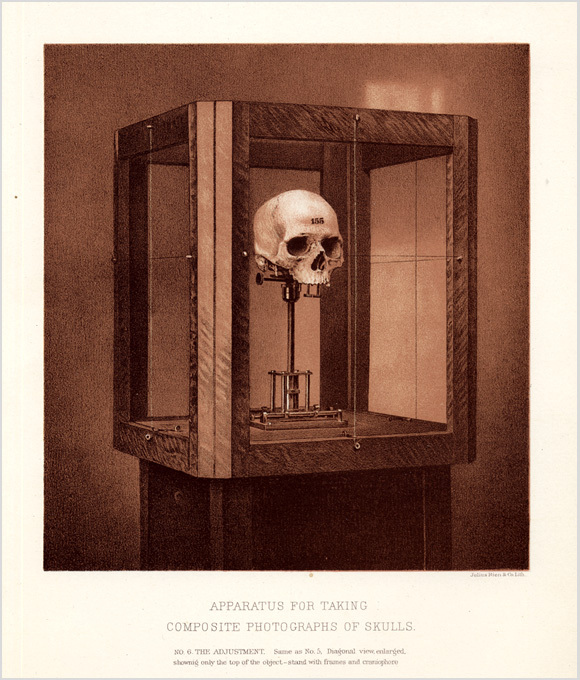 Photo captions: Apparatus for taking composite photographs of skulls. No. 5[-8]..etc. Captions include descriptions of the craniophore. Index Medicus: 20309981410, 21002681090, 40202991260, 40309531070, 11101211430 (reprint).